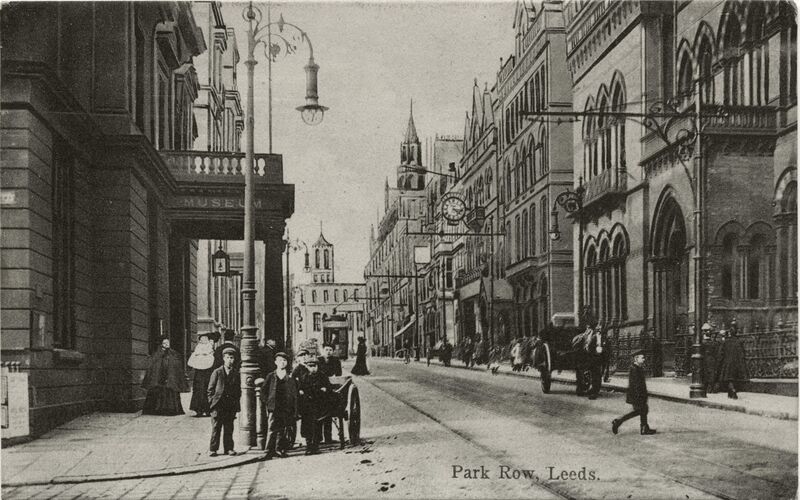 “Old photo postcard of Park Row, including former premises for Archibald Ramsden, Park Row, Leeds, West Yorkshire, England. The shop was designed by George Corson, was completed in 1874, and had three gables, which you can see halfway along the row on the right. The shop was demolished in the 20th century. The large portico on the left belonged to the museum, which is now in the Mechanics Institute. The large building in the foreground on the right was demolished to make way for the present NatWest bank. The church facing the end of Park Row was the old St Anne’s.